Calamity Co Dance: Weekday Calamity - Vacate Vacate Vacate! Weekday Calamity - Vacate Vacate Vacate! Happy Weekday, Calamitous friends! 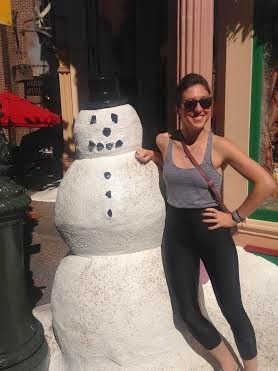 I don't mean to brag-blog, but I am writing to you now from the sun and warmth boasted by Central Florida. 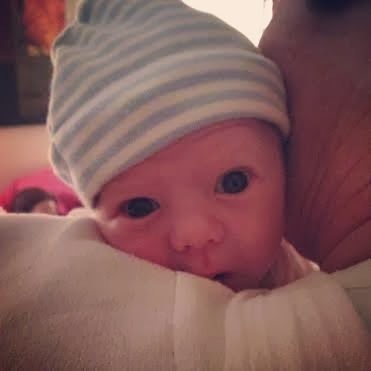 This vacation is not all sunbathing and relaxation; I have a new nephew here who requires many much snuggling! Hey, tiny & cute baby! Vacation, as excellent and wonderful as it's always expected to be, is often a slight source of stress to me. It's a huge break in your normal routine...the basis of its appeal, I know...but it can complicate aspects of your life that are otherwise simple. (If you're me, anyway.) Thus, for this Weekday in a Calamity, I wanted to share the two big (and albeit, basic) ways I am forcing myself to actually vacate during this vacation. Amy has a new boyfriend! 1. Keep it Simple, Style! I HATE PACKING because I never know what I will WANT to wear on any given day. For this reason, I tend to pack some of the most basic clothing I have. Why? Because basics go with EVERYTHING. They are comfy and versatile and the tone of the outfit can be tweaked with shoes, jewelry, a scarf...smaller items that are easier to pack. Mixing and matching add variety, while still keeping you comfy and terribly, terribly chic. The good thing that comes from this break in your routine are the sweet, sweet changes that you can (and should!) allow yourself to make. For me, this splurge came in the form of an enormous, incredible, mouse-eared macaron and a second cup of iced coffee. Vacation is the perfect time for a quick and brief caloric splurge. 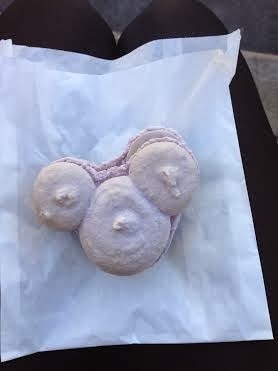 Where at home can I get a Mickey macaron? No where. Can I have a second cup of coffee at home? Sure, but I so infrequently allow myself to, that I almost felt like my elementary school principal was going to crawl out from behind the counter and award me a "pink slip" for such amoral coffee consumption. This treat, however, was well worth staying after school and writing lines. Now, it's not to say that I don't eat macarons occasionally at home...that is certainly not the case. This one was different because there was no internal bargaining, no "I'll eat less for supper" or "I won't buy any sweets at the grocery store." The thought was "I'm on vacation and I wanna eat that, so I'm gonna eat that," a line of thinking so healthy that it pretty much burns all the calories in the dessert ANYWAY. So, in conclusion, when you go on vacation, make sure you GO ON VACATION. Know what's gonna stress you out and ignore, avoid, and solve before you create your own problems. I'm Looking forward to getting back up north and making some dances and other art with some of my favorite people, but for now, there's a blue-eyed boy that I just NEED to squeeze. Happy Wednesday, all! Be calamitous!